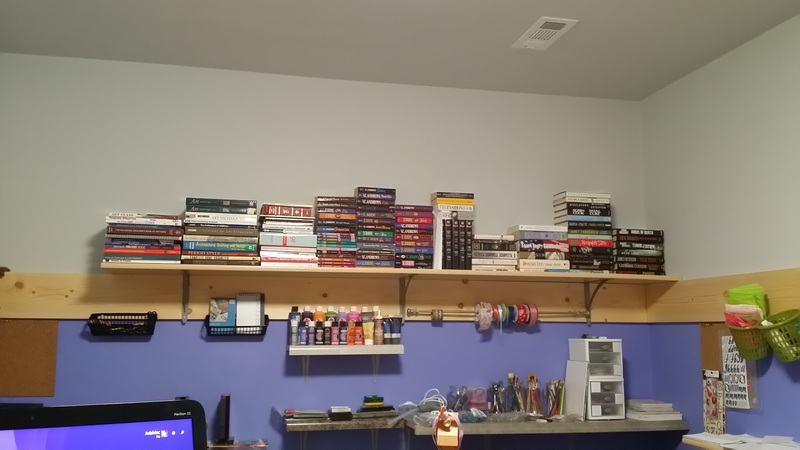 This wall will sometime in the future be my rows of shelves for my books. I have not brought all my books from the Puzzle House yet. I am waiting until this is done so we don’t have to work around them. I have well over 1000 books. 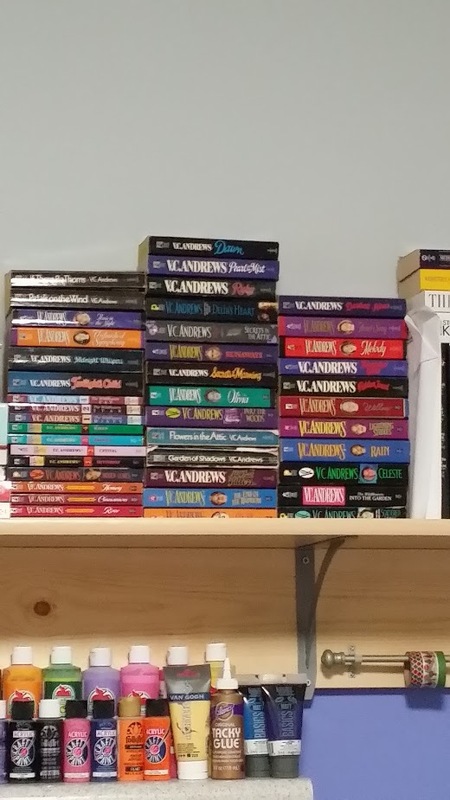 A few years ago I cataloged all but the paperback Harlequin novels on a phone app. I lost the app when I changed phones. I don’t think I will bring the Harlequin novels here, thinking I will keep them at the Puzzle House. After all, need books there too! This is my library at the Puzzle House. I miss those shelves. Hubby did a great job making them. Once all the books are off I need to sand and put a clear coat on so I can actually dust them. It is rather difficult dusting right now because the cloth sticks to the shelve. 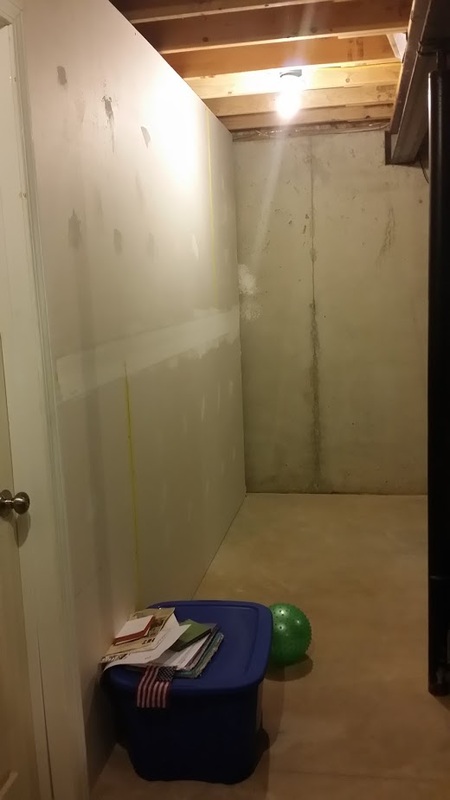 I didn’t sand only painted. I’m thinking of doing some wire doors in areas of the shelves. I think that will be neat looking. My favorite collection is my V.C. Andrews novels. I am behind on buying them and way behind on reading the new ones. 🙂 I first read My Sweet Audrina in Jr. High. I was hooked. I have only read this one and the Flowers in the Attic series. Yes, I am way behind on reading all the other series. I kept buying them because I knew I would read them someday. I think that day is coming. Do you buy collections or series? 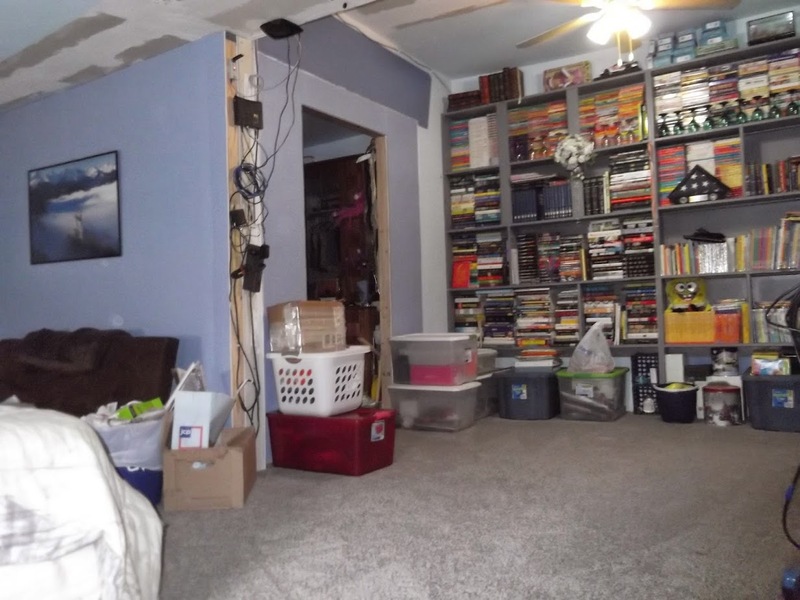 This entry was posted in JC Home, Puzzle House and tagged books;, library, novels, paperback, puzzle, remodeling, shelves, Writing. Bookmark the permalink. I do, but I don’t like to. And I don’t like to start reading them until they’re all written. I loved the Flowers in the Attic series, although I read them 30 years ago, they have always stuck with me. I wish I had them now for my daughter to read! I read some of Heaven, but I think I lost interest around book four. A few years ago I reread the Flowers in the Attic series. My copies are worn. My daughter read a few. She likes vampire books more. I read Heaven but haven’t the others yet. That looks awesome! When I get a house I hope to have the room to have my own library. Thank you. Glad my hubby tolerates my love of books. A library is a must. I’m going to the library more often these days. And I buy iTunes cards and download. I live in a flat. The spare room is the library now, but I’m finding that I have books there that, though I’ve loved them, I haven’t gone back to many of my books in decades. What’s happening to me, Jules?